This was sent to me for review by the publisher, but this is no way changes my opinions on the book. I wasn’t a massive fan of Dorothy Must Die. I enjoyed it, but I read it at the wrong time in my life. It’s a very dark book and I read it right after books about the Holocaust and suicide…I’m great at planning ahead, clearly. 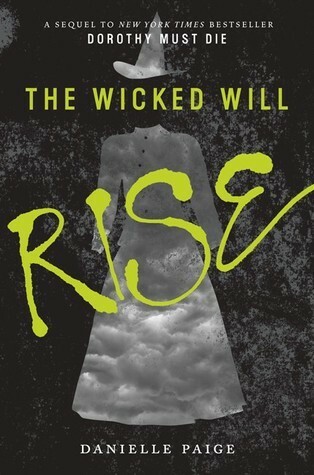 I knew I wanted to read The Wicked Will Rise anyway to give this series another chance. I’m so glad I did. Originally I was shocked when I opened the package to see how thin this is. The first one was so big and this one just wasn’t. As it turns out, that was actually a good thing. This one had much more action and much better pacing – I read it in a matter of hours because I just couldn’t tear myself away from it. I liked Amy a little better in this one. There are moments where I really, really loved here and then there were parts in which she kind of annoyed me. There were a lot of new characters in here that I absolutely loved as well as a few old favourites. I’m very interested to see where some of the characters are going to develop from here. I wasn’t so bothered by the darkness in this one – I suppose I sort of expected it this time around. I have to say, there were still a few parts in which the level of violence still kind of surprised me. This is definitely not a book for the faint hearted. I think the only thing I really dislike about this series is the synopsis. I think the whole ‘mission’ thing is cool, but the missions never have any relevance until the end of the book. It’s kind of spoiling what the next book is going to be about. All in all though, I did really like this and I’m glad that I can the series another chance. I can’t wait to see where the next book is going to go after that ending. Thank you to Harper Collins Australia for sending me a copy of this for review!